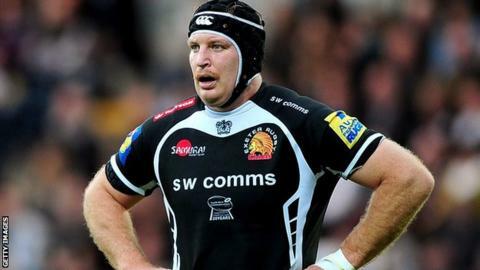 Exeter head coach Rob Baxter says back-row Thomas Waldrom deserves his chance to play for England again. "He's probably been one of the in-form players through this start of the season period who may not get any international exposure, which is a shame," Baxter told BBC Sport. "But at the same time it's great to see him being recognised and being brought back into a squad that he previously dropped out of." Waldrom was part of Lancaster's squad but has not featured since. The New Zealand-born forward in the summer. He joins club team-mate Jack Nowell in the 34-man party, although no Exeter players have made the final 23-man squad for any of England's three games so far this autumn. "It's no secret that we want as many players as we can to play international rugby, it's a big part of showing how your squad develops and how you develop as a club," Baxter said. "But I think it's difficult for them now, I think they've done all they can do. The selection now will be made for this final game, they've shown great form over the last two or three weeks. "What it's down to now is training well today and carrying on that form in an England training camp and then hoping that an opportunity arises. "From Exeter's point of view, we're in a bit of a no-lose situation. "We'd be delighted if they make through to the England 23, and at the same time we'd be delighted if they're at home here with us in what's a huge game for us (at home to Saracens)."